This paper provides an assessment of the effect of incorporating edge deposition in the evaluation of critical load exceedance in forests, taking into account pollutant type, meteorological conditions, edge orientation, and forest type. In particular we have calculated critical load exceedance in five Flemish regions differing in forest fragmentation extent and/or share of coniferous forest. Digitale versie van de Bosreferentielaag van Vlaanderen [Digital forest cover map of Flanders]. OC GIS-Vlaanderen, Brussels, Belgium. Atmospheric deposition to the edge of a Spruce forest in Denmark. Environmental Pollution 60 (3-4): 257-271. On the importance of incorporating forest edge deposition for evaluating the exceedance of critical pollutant loads. Applied Vegetation Science 10: 293-298. 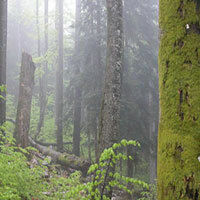 Atmospheric deposition in complex forest landscapes. Boundary-Layer Meteorology 69: 343-366. ArcView 3.1 GIS and mapping software, Environmental Systems Research Institute, Redlands, California. Intensieve monitoring van het bosecosysteem in het Vlaamse Gewest. Technisch rapport, eindverslag 2004, meetjaar 2003 [in Dutch]. IBW, Geraardsbergen, Belgium. Edge influence on forest structure and composition in fragmented landscapes. Conservation Biology 19 (3): 768-782. Berekening en kartering van kritische lasten en overschrijdingen voor verzuring en eutrofiëring in bosecosystemen in Vlaanderen. In: “Bepaling van de verzurings- en vermestingsgevoeligheid van Vlaamse bossen met gemodelleerde depositiefluxen. Eindverslag van project VLINA 98/01” (Neirynck J, De Ridder K, Langouche D, Wiedeman T, Kowalski A, Ceulemans R, Mensink C, Roskams P, Van Ranst E eds) [in Dutch]. IBW, Geraardsbergen, Belgium, pp. 44-100. The use of critical load exceedances in abatement strategy planning. Water, Air and Soil Pollution 85: 2431-2436. Numerisch Simulationen zum Einfluss von Waldbestandsinhomogenitäten auf die Windverhältnisse un die trockene Spurenstoffdeposition. PhD thesis, University of Hannover, Institute for Meteorology and Climatology, pp. 100. Nitrogen deposition and nitrate leaching at forest edges exposed to high ammonia emissions in Southern Bavaria. Water, Air and Soil Pollution 152 (1-4): 233-255. Patterns of throughfall deposition along a transect in forest edges of silver birch and Corsican pine. Canadian Journal of Forest Research 38 (3): 449-461. Comparison of forest edge effects on throughfall deposition in different forest types. Environmental Pollution 156 (3): 854-861. Gradual forest edges can mitigate edge effects on throughfall deposition if their size and shape are well considered. Forest Ecology and Management 257 (2): 679-687.